This guide will cover how to author your own supervised content. Basically the code will detect if the person viewing the content is a supervisor or learner. You will then need to add two variables. These are the primary variables to get the supervised content working. The variable actor will store who is viewing the content. So it can be the value supervisor or learner. You can use the actor variable to show specific layers depending on who is viewing the content. 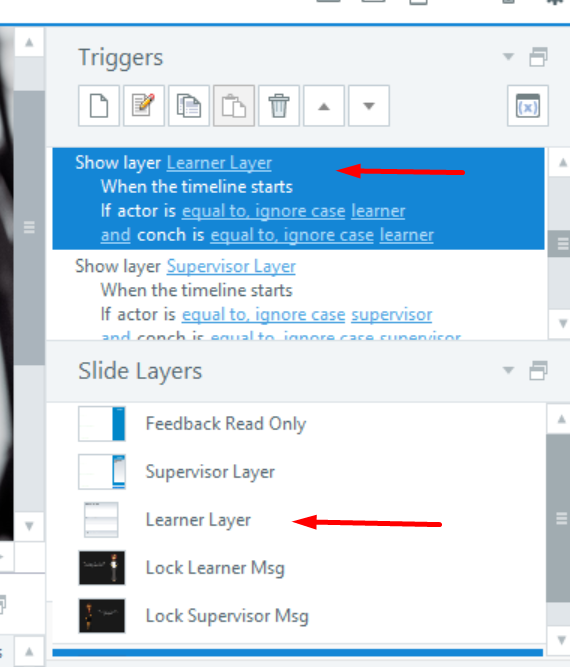 For example below, we have a layer called "Learner Layer" which is shown when the actor = learner. This means that when the learner is viewing the content, "Learner Layer" will be visible. Similarly for the "Supervisor Layer". The variable conch will be the person who is allowed to edit the content. So it can have the value supervisor or learner. The value for variable conch is set by you. We call this variable conch in reference to Lord of the Flies .. "whoever has the conch can speak". 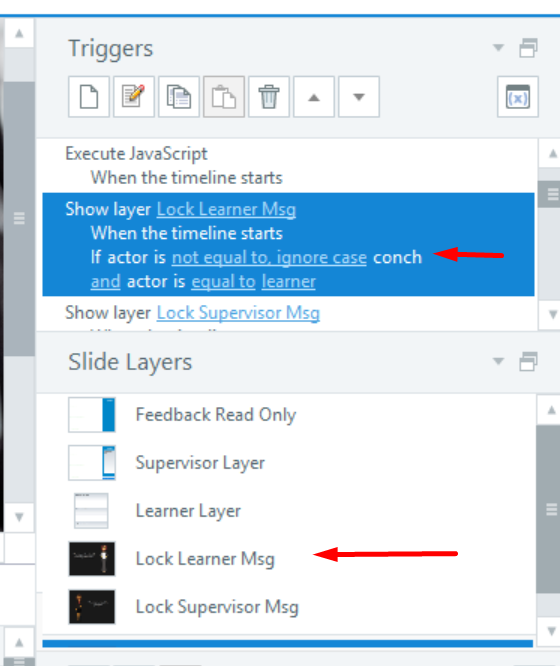 You can use conch to show "locked out" layer so that the a person can know when it is not their turn to view the content. So this layer is shown when the person viewing is not the person who is supposed to be editing i.e. if you don't have the conch you cannot speak! 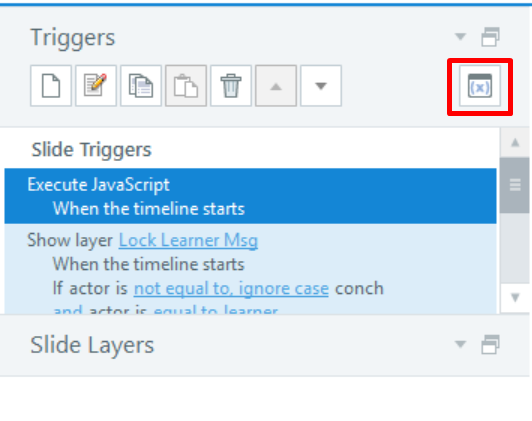 You should also add a condition on the triggers for clicking prev / next so that they can only proceed if the actor is equal to conch. Where is the conch variable set? This is up to you. In our sample content we have a "Review slide" that sets the conch value based on whether the next step has been unlocked. So on entering the "Review slide" the conch is automatically passed to the supervisor. 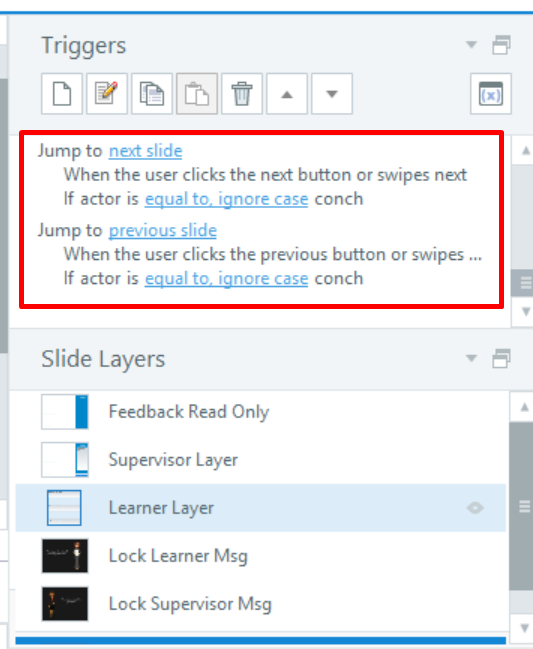 The conch is passed back to the learner when "Save Feedback" is pressed by the supervisor.